From formal events to football parties, chips and dip are one of the few foods that are acceptable at almost any function. Since the first person dipped a chip into a bowl of sauce, this perfect snacking combination has evolved from a hotel specialty, to a mass produced snack food, to an inspiration for foodies everywhere to elevate the normal to the sublime. On Friday, March 23, make plans to celebrate National Chips and Dip Day and join others around the country by partaking in your favorite varieties of these simply sensational snacks. Potato chips were invented almost by accident in 1853 in Saratoga Springs, NY. As the story goes, one of the patrons at a local restaurant complained to the kitchen about the French fries. The chef, annoyed with the patron, sliced a few potatoes very thin, fried them, and sent them to the patron’s table to show his displeasure at the critique. The plan backfired however, because the patron loved the crispy wafers so much, the restaurant added them to the menu as a specialty item. It would take almost a hundred years for a traveling salesman named Herman Lay to bag them and start selling them all over the country. Lay, along with Elmer Doolin, who created the first corn tortilla chip called the Frito, would combine their efforts after WWII and formed Frito-Lay, the largest manufacturer of snack food in the U.S. in 1961. The popularization of dip would come about as the result of three coinciding changes in American culture during the 1950’s. First, the traditional formal parlor was replaced by the much less formal living room. Second, the Lipton Company had cornered the market on instant soup and was looking for other uses in order to increase sales. They launched a campaign that taught people to mix instant soup with sour cream and modern day dip was born. Third, American households began to get televisions and needed a finger-food snack they could eat while watching. Thus began our love affair with chips and dips. Regardless of whether you grab a bag of your favorite brand at the store or pick up potatoes at the farmer’s market to make your own, there is no question that when it comes to chips, potato chips are king. Sour Cream and Onion – Made from fresh, delicious sour cream and real onions. BLT Dip – Grab some bacon made from locally raised Arizona pigs and fresh tomatoes on your next shopping trip to make this fantastic dip. Dill Dip – Start with fresh sour cream and add dried or fresh dill for a fabulous dip. Colby Pepper Cheese Dip – Cheese goes great with everything! Make your own healthy delicious pita chips at home to pair with these fabulous, flavorful dips. Red Pepper Hummus – Start with fresh Arizona grown red bell peppers and this spread is sure to please the whole family. Spinach Dip – Featuring scallions, the vegetable of the month, this dip has great flavor. Artichoke Dip – How can you go wrong with fresh artichokes and parmesan cheese? Jalapeno Hummus – Grab some jalapenos at the farmer’s market and spice up this healthy hummus. Black Bean Hummus – Made with black beans instead of chick peas, this is a tasty twist on hummus. Sun-dried Tomato Hummus – Look for fresh basil at your grocery store of farmer’s market to make this delicious dip even better. Nothing goes better with a bowl full of bean dip than crispy corn chips. Hot Bean Dip – Taco seasoning, sour cream, and green onions give this bean dip a little zip. Chicken Enchilada Dip – This dip is such a mouthful it could be a meal by itself. Spicy Bacon Bean Dip – You can’t go wrong with beans and bacon! Layered Bean Dip – Made with some great Arizona ingredients like chilies and avocados. Goes great with Tortilla Chips too. Jalapeno Pepper Dip For something new, try this tasty dip filled with fresh flavors. 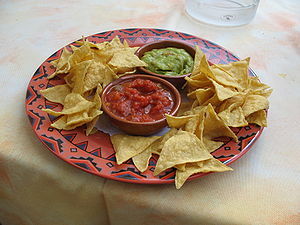 Terrific for pairing with all those sensational southwest salsas and dips, tortilla chips can also be made at home. This entry was posted in Food Facts, Recipes and tagged Dip, French fries, Frito-Lay, Herman Lay, Pita, Potato chip, Saratoga Springs New York, Sour cream. Bookmark the permalink.